Thinking About Kitchen Remodeling in Santa Ana? Cabinet Wholesalers is the company you can trust for outstanding kitchen remodeling in Santa Ana and surrounding Southern California communities. Whether you’re looking to reface your kitchen cabinets, install new flooring, or put in new countertops, we can do it all. Help you select a beautiful stain or finish for your kitchen cabinets and a door and drawer style that you’re going to love. Design a kitchen layout that meets your needs and reflects your tastes and helps to keep you organized. Has our team install your new kitchen with precision, leaving your home clean and your kitchen looking awesome! 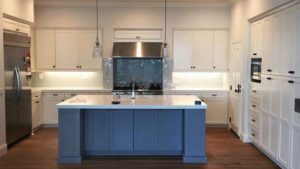 Whatever you have in mind for your new kitchen remodeling in Santa Ana, you can be certain that Cabinet Wholesalers is ready to give you the kitchen you’ve been dreaming of. Call us at 714-693-1111 and talk to a kitchen remodeling pro.